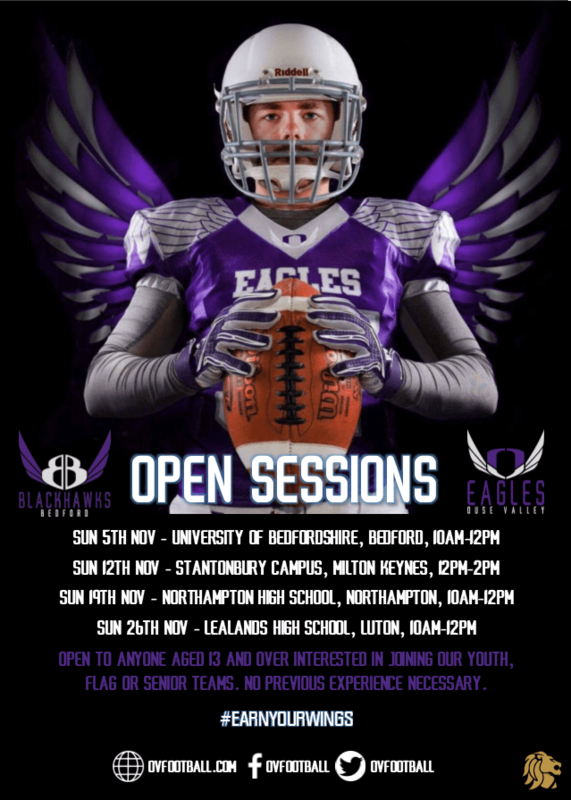 Open to those interested in playing for the Ouse Valley Eagles senior (18+), Bedford Blackhawks Youth (U17) or Milton Keynes Redwings (U17) full contact teams, as well as the Blackhawks senior flag (16+) team, the third Open Session of the month takes place this Sunday in Northampton. The session runs from 10am to 12pm at Northampton High School, and registrations open at 9.45am. Before the session you will be asked to complete a simple registration form (registrations open at 9.45am). Please note for U18s this will need to be completed by a parent or guardian. If you would like to download a registration form and complete it ahead of the session, you can do so here. It’s not too late to register your interest in either of our remaining sessions. Just complete the form below, get in touch via Twitter or check out the events on our Facebook page. As well as Sunday’s session we will be running an additional session on Sunday 26th November at Lealands High School in Luton, from 10am – 12pm.